Pesto sauce delivers a burst of flavor, pesto brings a fresh twist to a range of dishes including pizza, sandwiches, fish, chicken, vegetables, pasta, and a variety of other recipes! Reach for Barilla pesto sauce for a quick and tasty solution! 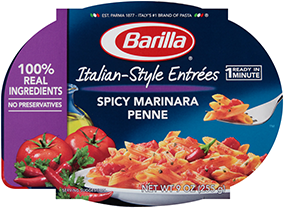 Barilla uses only the highest quality ingredients in our pesto sauces. Our basil pesto is made with 100% Italian basil and cheeses that offer a distinctive flavor for a variety of dishes. Delicious sun-dried tomato pesto, made with sun-dried tomatoes, capers, and oregano, is great on your favorite pasta, sandwiches, pizzas, and more!